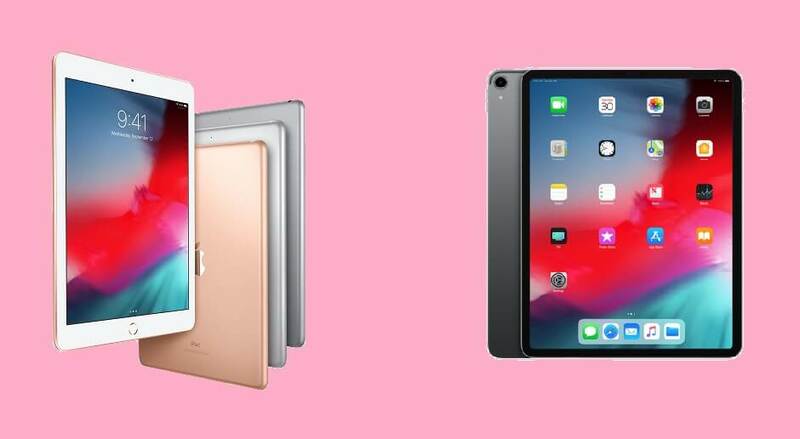 If you’re in the market for a new tablet, it won’t have escaped your notice that Apple’s long-established iPad is widely regarded as one of the best. We’d certainly agree that there’s nothing to debate there. However, a slightly trickier question concerns which model should you buy – the 9.7-inch iPad, or the iPad Pro? While the former offers great value and a compact but capable tablet, the Pro gives you a powerful processor, a drastic redesign, and compatibility with Apple’s latest stylus. We take a look at the models side-by-side, so you can see which one works for you. iPad or iPad Pro – Which is Best? Verdict: Which iPad Should you Buy? Though they come from the same stable, the iPad 9.7-inch and iPad Pro are two very different beasts. While they may look similar, their functions are poles apart, as indicated by their price tags – the iPad Pro will set you back at least twice as much as the 9.7-inch iPad. Apple is also selling the 2017 iPad Pro, which slightly muddies the water when it comes to choosing which one to pick up. There’s no such thing a bad iPad, but there is certainly a right iPad for you. We take a look at the range and help you find the best one. If you’re after an iPad, it’s worth knowing that you can’t really go wrong with either the Pro or the 9.7-inch. Both offer Apple’s trademark attention to detail and pleasing level of polish, and offer more than enough power for the average user. The Pro excels for creatives and professionals, although we’ve noted that the 9.7-inch’s update in 2018 brought it even closer to the iPad template set in place by the Pro. Dropping the Air moniker, Apple has simply called its standard model ‘iPad’. You’ll see it referred to as “the 9.7 model” quite commonly, which is a simple reference to its screen size. It’s the everyman iPad, and for most of us, it’s the obvious choice. So what’s so good about it? In essence, the iPad is the culmination of the last nine years of Apple’s iPad development. In design, it’s the classic before and after picture: slimmer, svelte and with thinner edges, yet still instantly recognisable as Apple’s iconic tablet. At just 478 grams, it’s also a great travel companion. Needless to say, Apple have upgraded the processor – it’s gone from an A9 to an A10, which means it can handle apps more easily than ever. It’s also had its Ram doubled, jumping from 2GB to 4GB, putting it on a par with the Pro. What this means is a snappy tablet that can handle multi-tasking (to a point). Battery life, as you might expect, is brilliant, and you’ll get 10 hours from the iPad between charges. This is the same as the others in the range, so you can rest assured that whichever model you choose, it’ll last you a good day of work/play before needing to find refuge at the nearest electrical outlet. And then there’s the price. While $330 is hardly pocket change, it does feel like an excellent price for the the iPad, especially considering the increase in specs and the narrowing gap between the 9.7-inch model and the Pro. The iPad Pro 2018 marks the iPad’s most drastic design change yet. At first glance, it’s still undoubtedly an iPad, but look closer and you’ll soon start to see the differences. Firstly, that iconic home icon is no more, having been replaced with Face ID unlocking. This is in part because the bezel has been drastically reduced, meaning that the screen can be made larger while still keeping the tablet portable. In fact, thanks to this space saving approach, the 11-inch Pro is only slightly larger than the iPad 9.7-inch, and actually weighs about the same. Going back to the screen for a second, Apple really wants to turn heads with its 11-inch and 12.9-inch displays, and has adopted the Liquid Retina display, as seen on the iPhone XR. It displays at the same 264 ppi (pixels per inch) as the 9.7-inch model, but has a wide color gamut, meaning image reproduction on the Pro has the edge. The 2018 iPad Pro is Apple’s only tablet that works with its 2nd generation Pencil, the stylus designed for drawing and annotating on the iPad screen. While compatibility with a stylus was originally a Pro exclusive, the 2018 iPad 9.7-inch model adopted it. However, the latest Pro has moved the goalposts again, being exclusively compatible with the latest Pencil. This Pencil features touch controls and handily attaches to the top of the Pro with magnets, where it charges itself. One small bit of bad news though – it’s not included, and costs $130. Finally, a heads up for audio lovers – the 2018 Pro is the first iPad to ditch the headphone jack. Apple still sells the iPad Pro 2017, and while it was cutting edge not so long ago, it’s now been surpassed by the new Pro model. Even the 9.7-inch Pad is creeping up on it, newly confident with a fresh specs upgrade. One of the 2017 Pro’s party tricks used to be compatibility with the Apple Pencil, although that’s now filtered down to the standard 9.7 iPad. However, it’s still more powerful than the standard model, although again, not as much as it was. At the time of release, the iPad boasted an A9 chip, while the iPad Pro 2017 ran an A10X. With the latest iPad now using an A10 processor, that bump in power is slightly less pronounced. Like the latest Pro, the 2017 model is compatible with the Apple Folio keyboard, which turns it from a tablet into a more traditional computer and is a life-saver during those long typing sessions. The standard iPad is compatible with third party Bluetooth keyboards, although none are quite as elegant as Apple’s own offering – another plus for the Pro. If you’re mainly a browser, streamer or social media addict, then the iPad 9.7-inch is the one for you. In fact, it’s the smart choice for pretty much everyone, outside of those with very highest demands on their tech. Chances are that most owners don’t even get close to stretching the iPad, and it’ll happily cope with your daily demands. Its recent specs boost proves that it’s no slouch, and while the Pro’s display does colors more justice, you won’t have any complaints in isolation. The iPad’s Retina display is still sufficiently gorgeous that your Netflix binges will look superb. Throw in the iPad’s newfound Pencil compatibility, plus its reasonable price tag, and you’ve got yourself a heck of a tablet that will last you a long time. If you’re a creative type, then the 12.9-inch Pro makes the most sense for you. Firstly, it has that bigger screen, making is easier to get perspective on your work as well as comfortably work on detail. You’ll also appreciate the new range of color reproduction. The A12 processor means you’ll be able to do some serious video/image editing, without the iPad breaking into a sweat or slowing you down. The new USB-C port, which replaces the Lightning port, is also a boon for artists, as it allows you to directly plug in a device like a digital camera to your Pro and export photos as soon as you’ve snapped them. It can also plug directly into a large display. The Pro also boasts improved cameras over the regular iPad, with a 12Mp camera and ability to shoot in 4K. For most office workers, carrying the 12.9-inch Pro between meetings might not be ideal. However, the 11-inch is deceptively diminutive, while still managing to offer up a decent size screen. That A12X processor means that no matter what applications you’re using for work, you won’t cause your iPad to burst into flames, and it’ll handle the most graphically intense presentation that you can muster with ease. It’s also a handy tool for business meetings online, with the front facing camera producing a Full HD image, and the four speakers (compared to the iPad’s two) helping pick out the voices of your meeting pals loudly and clearly. Then there’s the Apple Pencil 2, which does feel like an integral part of the Pro experience. It’s an excellent tool for making notes or sketching ideas quickly, while the clever magnetic hold and charge solution that Apple has hit upon makes it even more compelling. Another peripheral worth mentioning for business users is Apple’s folio keyboard, which is the perfect companion for the 11-inch model and will make typing those reports a lot more comfortable and enjoyable than doing it on the screen. It also frees the display of the virtual keyboard, so your view won’t be obscured while you work. For more information, read our guide to the best iPads. Like we said at the top of the page, knowing which iPad to buy depends entirely on knowing what you’ll be using it for. Hopefully, you’re now somewhat clearer on what that is. To summarise, if you’re a typical user – and that’s most of us – the 9.7-inch iPad will do all you want, and more. Don’t feel like you’re compromising either, in not picking up the premium Pro – the iPad packs a punch in its own right, not to mention boasting a highly detailed screen and a slim design. If you’re a designer, artist, or simply have high demands from your tablet, plump for the Pro. It’s packed to the gills with processing power that puts many laptops to shame. You won’t be left wanting, and the A12x processor is ideal for image/video editing and general graphically intense work.